With your huge to-do list, we know it’s hard to keep an eye on popular products selling out. But the last thing you want is a ‘sold out’ product in the store just as the marketing campaign hits full spend! And ideally you want to know about it before it’s a problem – so how can you predict when you’ll sell out? Our brand new inventory management tool sends you alerts when you need to re-order stock, so you can get on with other stuff, safe in the knowledge that Music Glue is doing the thinking for you. We’re using an intelligent algorithm to predict when you’ll sell out, to make sure you get an alert with enough notice to order the stock you need. Unless of course you’d like to sell out! And if you manage multiple stores, we’ve launched Enterprise Inventory so you can manage all your inventory, for any store, in one place. Never run out of stock again - Set your requirements and we'll send automatic email updates reminding you when stock is running low or selling fast. You can snooze or remove alerts as you wish. 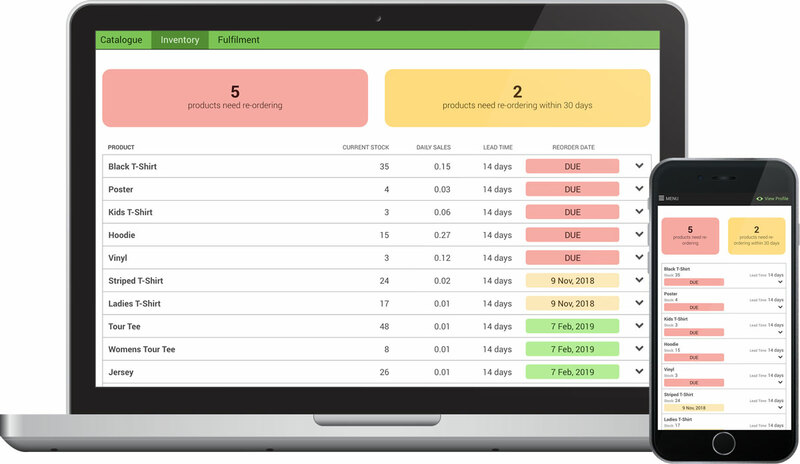 Set product lead times - Customise settings on a product level based on how long it will take you to manufacture an item and restock your fulfilment partner. Intelligent algorithm – To work out when you’re likely to sell out (and when you should reorder), we’ve worked with industry experts to develop and refine our intelligent algorithm. It calculates your daily average sales, then makes adjustments to counter sales spikes, to predict when you’ll sell out. Navigate to Products -> Inventory to see an overview, ordered by how soon your products will sell out. Expand each product to see details for variants or snooze alerts. Lead times are automatically set to 14 days as standard. To edit this and set a custom lead time, navigate to each product via Products -> Catalogue. Activate your Inventory Reorder Email Alerts via Settings -> My Settings. Set the day and time you’d like to receive the email and choose how far in advance you’d like to be notified. If other members of the team would like to receive alerts, ask them to login too and follow step 3 above. If they don’t yet have access to your store, check you’ve installed ‘User Management’ via Apps. Head to Settings -> User permissions to invite them and give them view access to ‘Products’ and ‘Settings’. Access your Enterprise section via the globe in the menu bar. Select ‘Inventory’ to see inventory management for all your stores in one place.